Santa brought me Rick Bayless's Mexican Everyday this Christmas, and I was so incredibly excited. This was probably the #1 cookbook on my wishlist, and I couldn't wait to start breaking it in. So far I have been very impressed. I love his philosophy of "everyday eating." Basically he discusses the importance of portion control and a well-balanced diet. Plenty of vegetables, good carbs, etc. He also stresses that is important to "feast" every once in a while for special occasions. Most of the recipes are actually pretty healthy, and so far, they have all been very tasty! 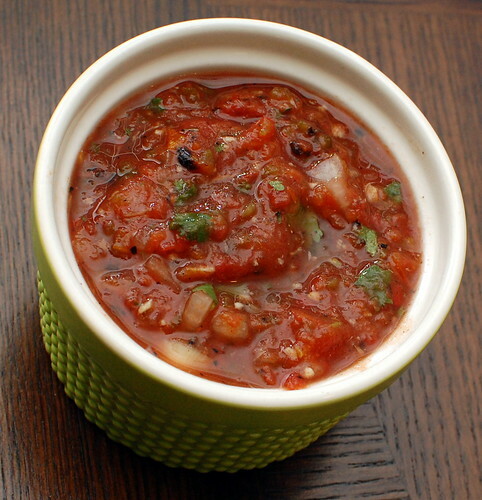 The first recipe I'll be sharing with you is his recipe for Rustic Roasted Salsa. One of my favorite things about summer is the abundance of tomatoes and fresh produce. I absolutely love making salsa in the summer, and pretty much have it in my fridge at all times. So I kind of fall out of the habit as the weather gets colder, and the tomatoes go out of season. This is a great alternative to fresh salsa, using good quality canned diced tomatoes, then roasting the garlic and jalapenos to add some extra depth of flavor to the salsa. The result was spicy, smokey, but still fresh. The key is to use good tomatoes. I used Muir Glen Organic Fire Roasted, and they really have great flavor. This is very simple to throw together, and keeps well when refrigerated. I snacked on this for a few days, then used the rest to make some black bean chili. Stem and peel the jalapenos, and scrape out the seeds and membranes (or leave them if you want the salsa extra spicy)! Peel the garlic, and transfer it to a food processor, along with the jalapenos. Pulse until they are finely chopped, then add the tomatoes (with their juice), and pulse a few more times to make the salsa as smooth or as coarse as you want. Pour the mixture into a medium bowl, and add the onion, cilantro, and lime juice. Stir to combine, and add salt to taste. Cover and refrigerate, or serve immediately. YUM! Rick Bayless just doesn't make a bad recipe, does he? This salsa looks great! Looks delicious! I love making different salsas, especially if it's from Rick Bayless. Thanks for sharing. I recently got this cookbook as well and it's fabulous! I've loved every recipe I've tried. This salsa looks delicious! i think i'm going to have to try this! i make roasted salsa all the time but i roast all the veggies before dicing/pureeing them which doesn't take that long but sometimes you just want salsa faster!! this looks fabulous and i love that it uses a can of roasted tomatoes! Santa brought me that cookbook, too. I haven't used it yet, but I think you've helped me pick my first recipe. I have the MG fire roasted tomatoes in my pantry already. I was really happy to read your advice on this salsa. Thanks! this looks soooo good! i love your blog, you always have such tasty food and beautiful photography! Excellent salsa! Thanks for the recipe. I made this last night - holy yum! I threw in the last two canned chipotles in adobo that I had and it was fantastic. Thanks for sharing! 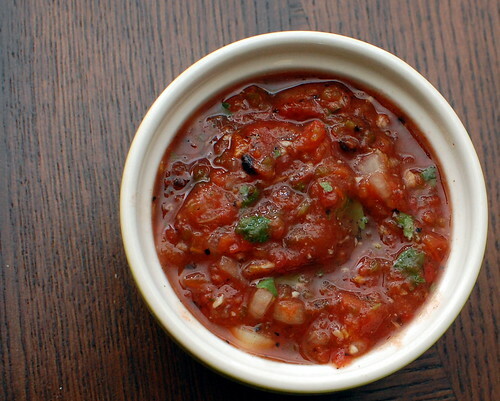 This is the best.salsa.ever. Love it! I'm anxious to try this salsa. I have one question though... What's the purpose of "rinsing" the chopped onions? Thanks for your wonderful blog. any chance you know if this can be processed in a water bath to preserve or is it only for fresh consumption? thanks! I've never tried it, and personally I'm not too comfortable playing around with canning - I'm too paranoid! !